SMU Admission Volunteers - Contact prospective, admitted students from your area and encourage them to choose SMU. SMU Career Volunteers - Provide career guidance to students and alumni by offering informational interviews or hosting a one-day job shadowing externship. 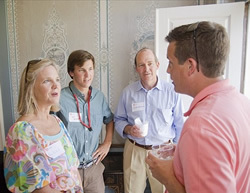 SMU Alumni Chapters - Lead the charge by organizing your area’s SMU chapter. Black Alumni of SMU Board - Promote the Black Alumni Scholarship and plan events for alumni. Hispanic Alumni of SMU Board - Promote the Hispanic Alumni Scholarship and plan events for alumni. Reunion Committees - Plan your class reunion. Sign Up as a Volunteer Today! Joining is easy! Just fill out our Volunteer Commitment Form, and a member of the Alumni Engagement team will contact you with the next steps. For questions about SMU's alumni volunteer opportunities, please call 214-768-1303 or email us at involved@smu.edu.